I think it was Richard Brautigan who penned the tale of an unemployed photographer recruiting a friend into a manic scouring of San Fransisco for hundreds of images of discarded Christmas trees. 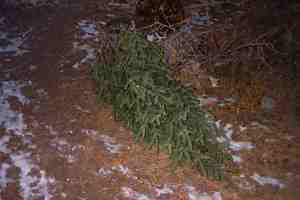 The tree had been stripped of its decorations and lay there sadly like a dead soldier after losing a battle. A week before it had been a kind of hero. Then I saw another Christmas tree with a car half-parked on it. Somebody had left their tree in the street and the car had accidently run over it. The tree was certainly a long way from a child's loving attention. Some of the branches were sticking up through the bumper.